If you have been following world news recently I assume that you have heard about the unrest in Ukraine and Viktor Yanukovych, the ousted Ukrainian President, is on the run for his unpopular politics and use of military against public protesters in Kiev. Since Viktor Yanukoyvch has been on the run the Ukrainian public and world has gotten a glimpse into his lavish and opulent estate in Kyiv, about 23.6 miles outside of Kiev, befitting of an overpaid politician. The Kyiv estate includes a private zoo, golf course, a Spanish wooden sail ship, fake ruins, and many other displays of ostentatious. The best part of Yanukoyvch's estate, his car and motorcycle collection. The former Ukrainian President had some good taste in collecting classic cars along with a fair number motorcycles. In Yanukoyvch's garage there are soviet-era consumer and military vehicles, Harley-Davidson motorcycles, BMW motorcycles, a Rolls Royce, a Bentley, a Classic Chevy, a Russian Chaika, and a whole lot more. Viktor Yanukoyvch's car and motorcycle collection is so extensive it rivals that of Jay Leno's Garage. I haven't seen a list of all the cars and motorcycles he owned but from what I can tell there are more cars and motorcycles than Jay Leno probably owns, at least from the videos, pictures, and what I've read about the Kviy estate. For Ukrainians Yanukoyvch's garage and the Kviy compound are nothing to joke about as Ukraine is practically broke. If Ukrainians wanted to raise some money for the country I'd recommend auctioning off some of the cars and motorcycles from Viktor Yanukoyvch's collection. Most of the vehicles look extremely well preserved and car collectors around the world would be interested. Some of they wouldn't mind paying shipping fees on rare vehicles even if it costs more than the car. 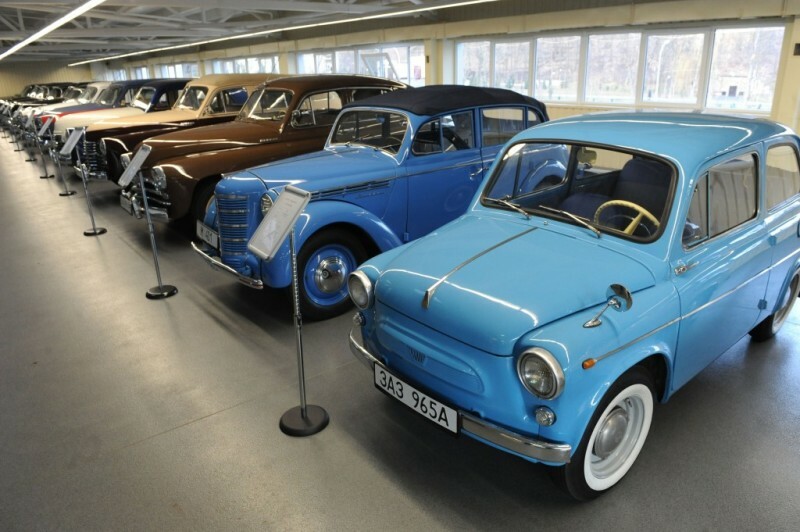 Maybe Vladimir Putin would want a couple of the soviet cars like the Chaika. Ironically a mechanic that worked on all of Yanukoyvch's cars and motorcycles said he rarely went to visit his cars. What a waste. If you can identify some of the makes, models, and years of cars and motorcycles in these pictures and videos please leave a comment below. We would love to be able to identify all the cars that Yanukoyvch owned.